This article first appeared in Pench Stripes Magazine, February 2016. The late summer showers trigger a peculiar phenomenon in the forests of central India. The air is moist; the sky a riot of blues and oranges separated by dark wobbly clouds, and the ground is moistened after a long spell of dryness. This sudden change in the temperature, humidity, and the moisture in the ground has signalled a sudden rapid change in the undergrowth. Underneath the surface of the moisture-laden forests, a million animals await to form their own clouds. Vibrating and pulsating with fervid life, the winged termites, called alates, begin their nuptial flight, volleying into the sky as if on a mission. If you happen to be sitting in the veranda, you will witness an upheaval of countless wings silently rising upwards with the warm air that is expelled by the cooling land, gliding down to the lights on your porch, flying aimlessly in an infinite loop around an incandescent source of light. But their flight is not aimless. 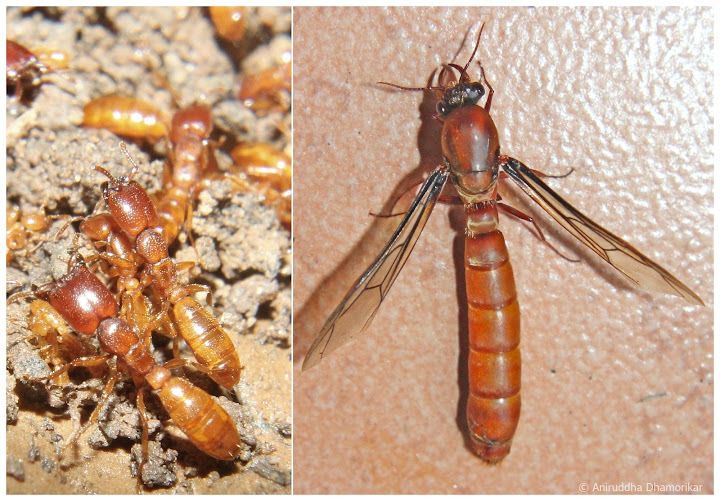 These winged termites have risen from their underground civilizations, each representing their own colonies, from every corner of the forest, to intermingle with one another, mate, and start their own new colonies. They are the queens and the kings who have sworn to spread their parent colonies wider and wider, and the warm air currents of the late summer are just perfect for them to fly long distances. Yet they are stymied by the light on your porch. And nobody knows why. Scientists have put forth several theories for this behaviour, such as for navigation, for warmth, because of their innate attraction to UV light, or because of confusing the wavelengths emitted by the light source for a mate; perhaps all of them are true, but the termites that revolve around an incandescent light are led into a trap – mantises, assassin bugs, geckos and lizards lie in wait to make a quick, easy meal out of them. Mornings reveal a battlefield. Hundreds of dead termites and four-times the number of wings litter the surface. But in this war-torn zone of your incandescent light, many females have found males, and have mated. As soon as they are mated, the male dies, and the female begins the second, and more tiring, part of their journey. She breaks her long leathery wings using her hind legs, and seeks to bury herself in the undergrowth where the soil is ideal for building her own colony. This female, the queen, may then live for several years building an army of her own, with a fortress as tall as seven feet high and just as deep, and rest in peace in the heart of her fortress as her sister queens manage her colony. But she might even die by that artificial light or in the undergrowth because of exhaustion, or turn up in the jaws of predators that lurk beneath. The colony is a walled city with roads and tunnels, halls and granaries, crèches and gardens. Each and every member contributes to its functioning – some grow fungus in the fungus gardens for consumption, some create a mulch of wood and soil to plaster walls – and some, like soldiers, guard the entrances– these soldiers are here for a particular reason. against intruders - including humans. Another social insect prowls in the undergrowth. Long, black, and glistening as though bathed in oil, the individual members of this colony march in a single long chain, one after another, which has given them their common name, the Procession Ant (Leptogenys sp.). They form multiple, criss-crossing highways in the undergrowth, and their colonies are usually underground, barely visible on the outside except for a small opening that is lined with soldiers standing with their mandibles stretched wide open. A troop of Leptogenys is on a mission. They’ve gathered a force strong enough to march towards the nearest termite mound, to force entry into the fortress, and raid and kill. The soldier termites, the nasutes, gather around the opening so as to block it. A battle ensues. They squirt an acrid liquid that entraps and kills the intruder, or thrust their beaked heads into them like a sword. The mandibulated soldiers bite and grind the enemies to pieces – and the ants downturn their abdomens to stab the termites by their poisoned knifes – they sting, bite and tear their enemies apart. The ants breach the walls of the fortress, and kill whatever that stalls their path, but the termites are able to overpower the invaders by their sheer numbers, and the ants retreat with bodies of their enemies as food for their colony. I’ve often found such raiding parties carrying one or even three bodies of termites in their mandibles, all the way back to their nest. Ants and termites are like sworn enemies. But their enmity is not the result of a feud or revenge – it is an ecologically-driven relationship where one social insect controls the spread of the other, and both compete with one another for resources such as food and space. 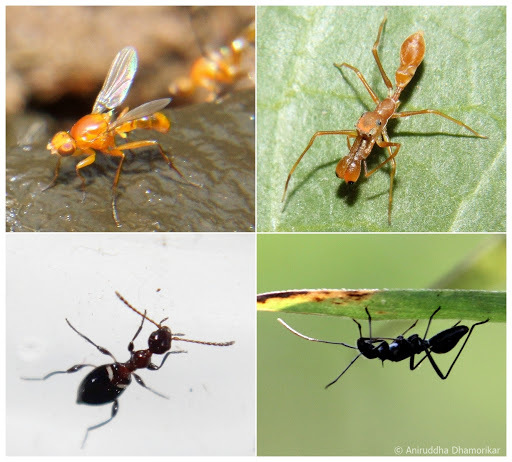 Several species of the arboreal ant Crematogaster sp. have been observed raiding ground-dwelling termite colonies. It is said that the ants raid termites not with an intention to annihilate them, but as an attempt to control their population as much as it is I think to showcase their strength. soldier Crematogaster stings one in the neck. The undergrowth is a place hard to comprehend. It is seemingly quiet and uneventful. Just the way a calm grassland bursts into motion at the alarm call of a deer, so does the undergrowth. The alarm signal here is invisible, inaudible, and unscented to us humans. It is a pheromone specific to a single species of an ant that helps them in finding their way to the battleground and back, and in changing their behaviour from docile to violent. Ants fight among ants as well – mostly over shared resources – often these fights are long battles that last a day. Arboreal ants like weaver ants (Oecophylla smargdina) often attack hunch-back ants (Myrmicaria brunnea), an ant which nests at the base of large trees and blocks the movement of weaver ants. Ants also fight with ants of their own species belonging to different colonies. If a soldier ant of Camponotus sp. comes upon a dealate queen (a queen ant who has shed her wings) in its territory, it fights and tries to drive it away, but if the dealate belongs to its own colony, they leave her alone. Quite often, only heads of rival soldiers are seen pinching the legs of the victorious, like badges of honour. the beginning of the monsoon. Notice the wing buds on the larger queen, which are absent on the workers. The ecology of social insects is much more complex than we can imagine. The caste-system of ants and termites taught in schools is a mere simplification of natural facts. The queen can be primary, secondary, or a gamergate; the worker can be a minor or a major, the major also acts as a transport medium for minor workers or plays the role of a soldier. Primary queens can be overthrown and assassinated by younger gamergate. Some species of ants enslave other species of ants. These Weaver Ants had formed a bridge joining the main trunk of Mahua tree with its branch for easy transport of food. Some form living bridges between two branches, some boats to float on water, some chains to pull prey, and some form nests by linking their own bodies, head-to-tail. Some weave leaves together, some mulch wood, some dwell in rock crevasses, and some dwell underground – and some, rarely if ever, come to the surface except for their alates. Some hunt, some farm, some visit flowers, some scavenge, and some domesticate. and can be seen soon after summer showers or monsoons. One of the nomadic species of ants of central India is the army ant, Aenictus sp., a rare treat to see in the dry and mix deciduous forest undergrowth. At least two species call this landscape home. One is large, dark bodied with a slender pale abdomen, long-footed ant, and the other is a smaller, darker in colour. Both are known to form large raiding parties constantly on the move. They are blind, but they are one of the fiercest forces of the undergrowth – being able to take on insects, scorpions, even lizards, frogs, and small snakes. Their nomadic existence makes them hard to see, and once you’ve seen them in a particular place, they will be long gone until your next visit – they however tend to nest temporarily in places with an exposed tangle of roots and in rocky areas with many small crevasses. Chances of finding them here are possible. These little civilizations are not as aggressive as I make them sound. Ants and termites, like humans, largely lead peaceful lives. They go about their duties with dedication to their colony, and a majority of them seldom engage in conflict. The battles are rare occurrences, and only a few colonies face them perhaps because of a resource crunch. As many as five to six species of ants often live in one square meter area in a forest undergrowth, in complete harmony, and ignore one another as they go about their daily business just like in a large human metropolis. The lone or pair of ants we often see in our veranda are scouting ants in search of a food source. Once the scout has found a food source, it estimates its size and goes back to its nest, communicates the information to its members, and follows back to the food source. On this second trip, often more than three and as many as twelve ants are at its tail, nudging the scout to proceed – a walk myrmecologists call ‘in tandem’ – to the food source and take it back to the nest. There are some which have chosen the simple life of scavengers and harvesters. Some species of ants in the genus Pheidole are especially selective about their scavenging – they often scavenge bodies of the large Camponotus sp. of ants, and seem to decorate their ground nest entrances with the heads of these ants, perhaps as a grotesque warning to the enemy! commonly observed along forest paths. Other species of Pheidole and the genus Monomorium are harvesters – they harvest the seeds of wild as well as domestic grasses such as rice and wheat, remove the seed from the husk, keep the seed in the granary and leave the husks outside the nests in a pile. Thin, long highways of harvester ants radiating out from the stack of harvested rice and leading to a small burrow in the ground are common in agricultural fields in the month of November. of nesting inside the tree-nests of Crematogaster ants. The sheer abundance of ants and termites has, quite naturally, led them to be exploited by other animals as well. 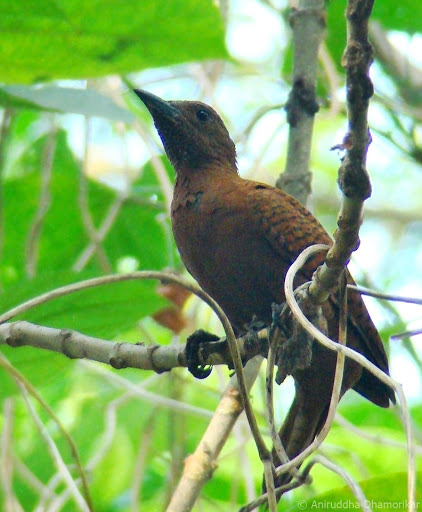 Besides distinctly large mammals such as the sloth bear and the pangolin which feed primarily on ants and termites (animals which largely depend on ants for food are called myrmecophagous), the Rufous Woodpecker, a rather uncommon bird of central India, nests in the arboreal wood-mulched nests of the Crematogaster sp. of ants. Several species of the blues family of butterflies (Family Lycaenidae) exploit an ant’s sweet tooth for honeydew. Such caterpillars have special glands called myrmecophilus organs which open on their backs and secrete sugary liquid that attracts ants, and the ants in turn protect them. Many species of jumping spiders in the genus Myrmarachne mimic ants, and are often species-specific mimics, like masked infiltrators that prey on ants. The antlions build sand traps in strategic locations where movement of ants is common, and some areas appear as minefields for ants – one missed step and they fall inside the collapsible walls, and into the wide jaws of this ambush hunter. mimicking Camponotus sp. of ant from the family Coeridae. Some insects, such as the hatchlings of broad-headed bugs mimic ants perhaps because looking like one offers protection. Some assassin bugs adorn dead bodies of their ant victims on their backs for camouflage. Some crickets and beetles live inside ant colonies by mimicking their pheromones, and feed on food gathered by ants. Some flies are also parasites and parasitoids of ants, and are mostly found near ant trails or ant nests. These infiltrators, imposters, and misfits dwell alongside such social insects largely because they gain something from one of the most efficient colonizers of the undergrowth. Many myrmecologists, evolution scientists, and even urban planners are turning to ants and termites to understand their efficient ways of societal cohesion, architecture, resource utilization, and even road traffic regulation. for protection and to ease the flow of the to-and-fro traffic. If all the ants of the world were weighed, they would weigh as much as humans do, claimed E. O. Wilson. This is a direct attribute of their social life – living together. But this is not the only reason why ants are not only so common, but also successful; their success stems from the reason that an ant or a termite colony behaves as one single super-organism, its functions are in tune with the welfare of the entire society. Perhaps we should look down in the undergrowth to understand our own societies, study the way we function, and how to function in a way that is in sync with the ways of nature. Two major workers of Camponotus sp. interact with one another during a monsoon night. We really need to lie down in the grass once in a while and observe these enchanting inhabitants of the undergrowth – see them go to work each day, greet each other with their inquisitive elbowed antennae as if shaking hands, clean their homes, and look after one another. In appreciating these small wonders we’ll begin to understand the little threads that make the vast web of life, held together by an unseen force we like to call by many names, but more so to witness a force way simpler but ever so overwhelming – the force of oneness that binds us all, ant and human alike, together. And do watch Lord of the Ants, a documentary about the study of ants by Professor E. O. Wilson. Also read Story of the Yellow Crazy Ant. Pench Stripes magazine can be downloaded here. Well written information .Thanks for sharing.